Tell me if you agree…. if it’s worth organizing, and putting into pretty containers, well then…. certainly its worth labeling, right? 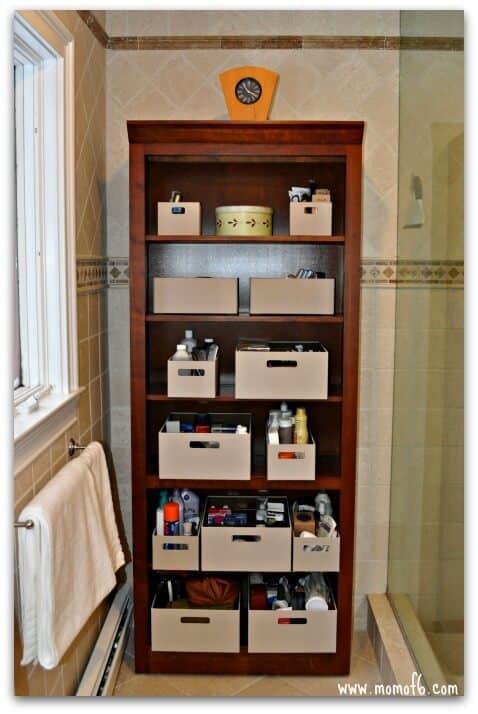 If by chance, you happened to catch my post over at Momof6 on how I am dealing with my storage-challenged bathroom, you have seen how I have re-purposed our old family room bookshelf and used it to house a set of beautiful Rubbermaid bento-style fabric boxes to hold all of our toiletry items. 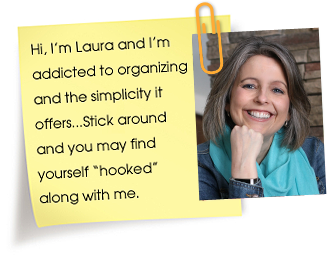 I love that we were able to pull together a system that works for us…. but our solution has ultimately led to another frustration. With so many storage boxes of the same color- I can’t remember what I’ve stored in each one! And I’ve already made that awful mistake of running out to the store to buy something I already owned… but couldn’t remember where I stored it- dental floss! Clearly I need some labels. And fortunately, I know just how to create them…. for FREE! Using my favorite photo-editing website, PicMonkey! So while I am sitting here creating some cool new labels for my fabric containers, I thought I would create this tutorial for you- so you can make your own labels for your home! PicMonkey is an online photo editing site. It has a free version, which is all that you need to create labels, but if you would like access to even more fonts, shapes, and photo effects, you can upgrade to the “Royale” version for $33/year (which is the version that I use). PicMonkey allows you to create new graphic designs and enhance photos, but it does not store your images- so you will need to download them to your computer once you are done (and I’ll cover that step below). So let’s get started! 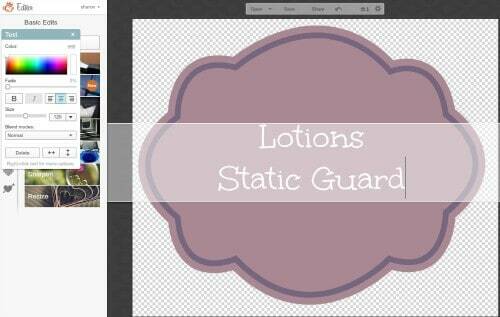 Head on over to PicMonkey, and click on the Design button at the top of the page. Next click on the Square shape. 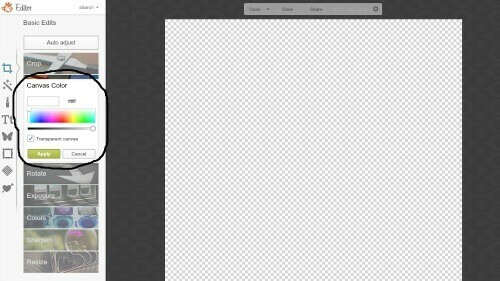 On the left side of your screen, a box will open, allowing you to choose the background color for your design. Since we are going to create labels that fit inside of a pretty shape, I suggest that you click the box for Transparent Canvas. Click Apply. Now let’s add our shape to the canvas. Click on the icon that looks like a butterfly, which allows you to add an Overlay. Using the slider bar to the right of the buttons, scroll down until you see the button for Labels. Click on the button to open the label box. If you are using the free version of PicMonkey, you can select from one of the 12 shapes at the top. If you use the Royale version (as I do), then you can select from any of the shapes. Choose the shape you want to use for your label by clicking on it. It will appear as a small image on your canvas. You can increase the size of your shape by grabbing any of the corners and pulling outward to enlarge. You can also drag it and drop it anywhere on your canvas. Using the Overlay pop-up box, you can change the color of your shape by selecting from the color palette offered. I happened to select one of the Royale shapes that allows for a contrast border color within the shape, and you can select the contrast color from the color palette as well. Click on the Tt icon on the left side, and then on the Add Text button at the top of the page. A text box will appear on your canvas. Click inside of the text box and add the text that you want to appear on your label. You can then drag the text box to the place where you want it to appear inside of the shape, and you can increase the size of the text by pulling on the corner of the text box to enlarge it. (Here’s a tip: keep your text box super long so it extends past the end of the shape. That will make it easier for you to select the text box vs the shape). You can play around with fonts for your text by using the slider bar on the left side of the page. As long as the text itself is highlighted within the text box, you can keep clicking on fonts to see what your text looks like in the new font. You can change the color of your text too- using the text pop-up box and selecting a color within the color box. Click on the box-shaped icon on the top of the left side of the page, and then click on the Crop button. 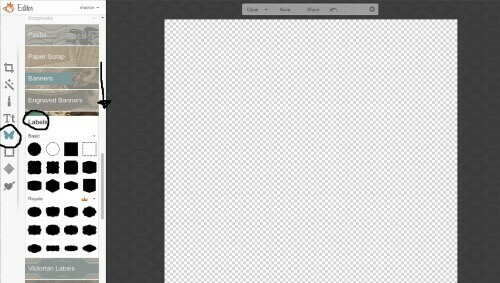 Using the corners of the cropping box to re-size the canvas. You want to crop close to the size of your label shape to make the printing process easier later on. Click on the Save button at the top of the screen. You will then need to name your file and click the save button at the bottom. A pop-up box will appear so that you can decide where on your computer you want to store your label. As long as you keep PicMonkey open, you can edit your design, so changing the text to create the next label is easy-peasy! Simply click on your text box, change the text inside of the box and then click the save button. Be sure to give this new label a different file name so that you are saving the new label as a unique file. 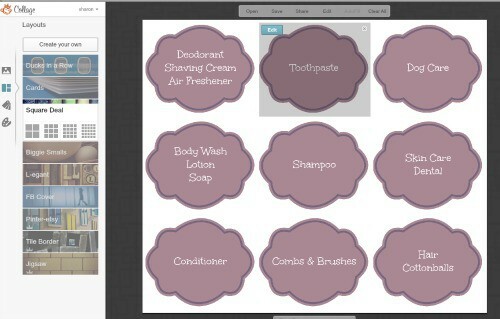 Here’s an easy way to efficiently print your labels on all on one page. Open a new window of PicMonkey and select Collage from the top of the page. Select Computer as the place where you want to find your photos. Select all of the labels that you have created. They will open up and display as small images on the left side of the page. Click on the 2nd icon on the left that looks like a set of boxes, and then select “Square Deal”. Select one of the designs to print multiple images- I like the one with 9 boxes on it. 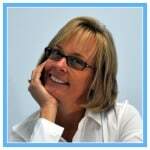 Use the Autofill button at the top of the page to add the label images to the grid. I then re-size the page so that all of my shapes will display properly without cutting off the edges. 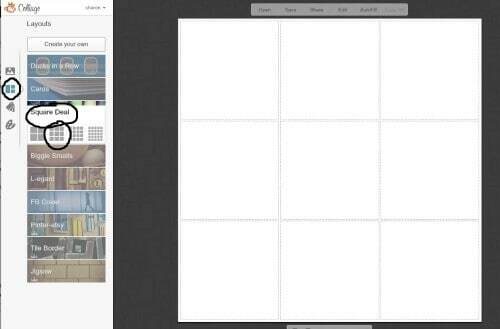 You can click on any of the sides of the page and pull it wider to re-size the grid. Click Save and name your collage of labels. Decide where on your computer you want to save your collage. You can then open it and send it to your printer to print your labels! 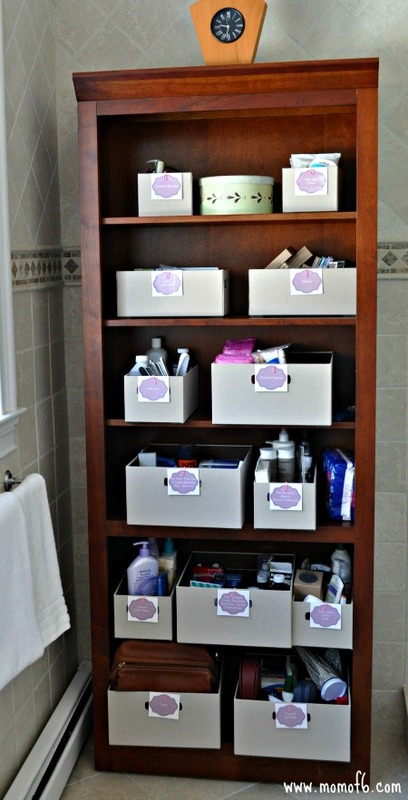 I love my new labeled containers on my bathroom shelves- and I know they will help me to stay organized! I think that PicMonkey is so awesome… that I’ve also created tutorials on how to use it to create birthday party invitations, as well as create digital scrapbook pages! So- have I inspired you to try PicMonkey too? 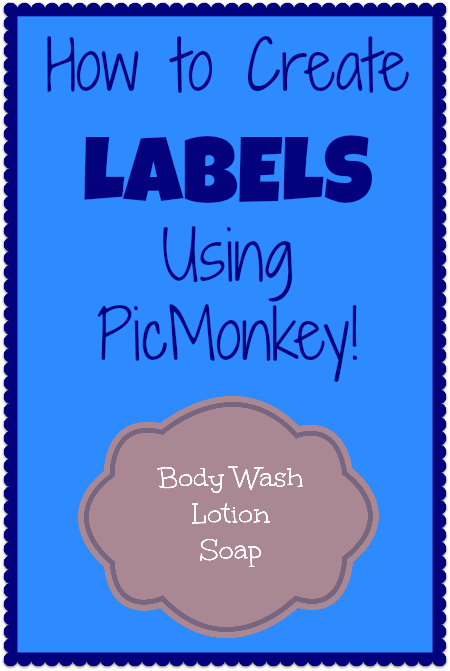 Wow, I love PicMonkey but never thought of printing out labels! So smart! I will definitely be using that-thanks for the idea! This is great! and I LOVE picmonkey! 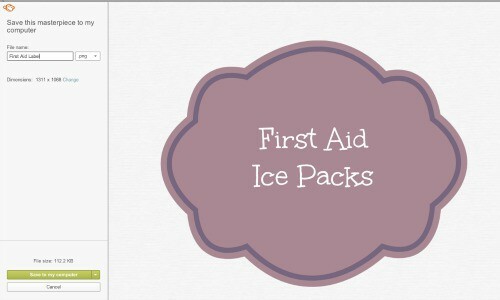 I haven’t taken the time to explore picmonkey so this is great and useful information! THANKS Sharon! Great ideas–I love all things PicMonkey. I’ve used it for photos, but the label idea is great. Thanks! Thanks Shelley- and to everyone who commented! I am glad that this tutorial helped you to see PicMonkey in a new way! I love picmonkey! this is a great idea!! Thank you showing us how to use PicMonkey. I need a tool to frame my before and after organizing pictures and I believe this will do the trick! I love PicMonkey! There’s so many creative things you can do there! This is a great tutorial and I’ll be pinning it. So glad I stopped by! So glad I found this! I’m also a brand-new blogger and this will be invaluable — especially the part about downloading stuff onto my computer so I don’t have to recreate the wheel every time I go into PicMonkey. May be a dumb question but I’m new to all of this! Do you print on some kind of sticker paper to make sticky labels? Thank you so much for this tutorial. I knew it couldn’t be super hard to do, but I was clueless. Thanks for saving me the money of not having to hire out.